This Spanish comfort food is actually something I grew up eating. What’s funny is that I never knew what it’s called, to this day. That is, until I saw a bunch of recipes online and thought… hmmm, I recognize this. 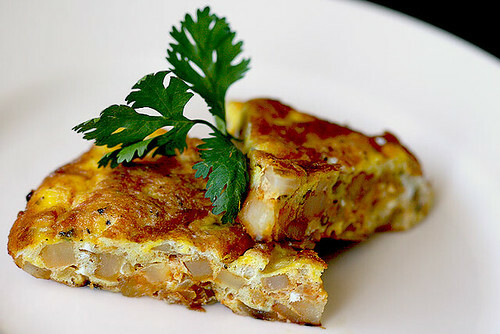 A simple omelet with just potatoes and onions? That’s it! The memories came flooding back and I knew I had to make one, quick! However, I wanted to add more flavor to it, this time. To give it a tad more depth. And also make the preparation a little simpler. So, I added a few more ingredients to the mix, such as garlic, paprika, cilantro and lemon… for the zing! Gotta have the zing! I guess I could’ve added some diced ham, as well. But then, that may be a little overkill for such a simple dish. Also, instead of mixing everything in a bowl, like it’s traditionally prepped, I cooked the potatoes first, then poured in the eggs over to finish it off. I didn’t think it made that much difference, at all. In texture or in taste, that is. Try this one sometime, you’ll love the simplicity and familiar flavors. Good for breakfast, snack, appetizer or, even a main course… served with rice, perhaps. In a medium-heated large skillet, cook diced potatoes with 6 tbs. EVOO, stirring frequently to prevent sticking. After about 8-10 minutes, stir in the diced onions, minced garlic and paprika and cook for another 8-10 minutes or until potatoes are soft and onions are translucent. Add the beaten eggs into the skillet to evenly smother the potato mixture. Cover skillet with a lid and cook for about 6 minutes or so, shaking the pan every now and then. Now, this next part is a little tricky and you need to be careful. Remove the lid and cover the skillet with a large plate. Turn it over so that the omelet is transferred to the plate. Add the remaining 2 tbs. EVOO in the skillet and slide back the omelet to cook the other side for another 4 minutes. Be careful not to overcook the eggs. Transfer to a cutting board and slice into 6-8 wedges. Transfer wedges to individual platters. Squeeze a little lemon juice on each wedge and garnish with cilantro and a lemon wedge. Ahh… the memories of youth! In the Philippines where I grew up, torta is a culinary heritage. A true comfort food. But it is no more than a simple omelet, really. The only thing different is that the eggs are whisked in along with the rest of the ingredients. 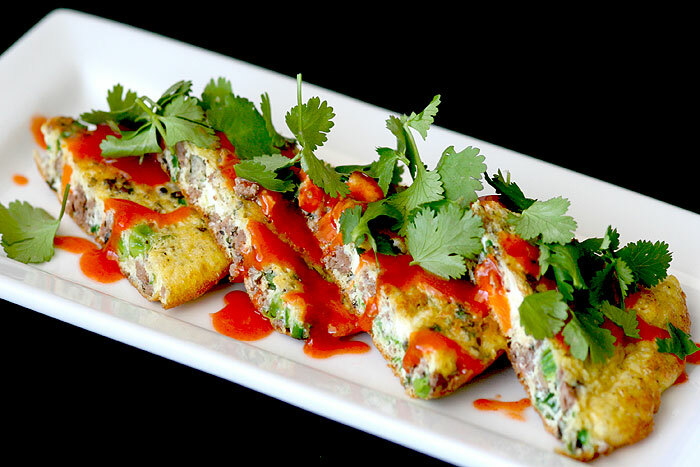 It is actually similar to frittata, sans the cheese. And they are usually cooked as patties in a skillet, just like you would pancakes. Torta is excellent served with rice, orzo, couscous, in a sandwich or simply snacked on by itself, dipped in a sauce. And you can dip it in almost any sauce you want… hot sauce, ketchup, thousand island dressing, hoisin, sweet chili, bbq sauce… anything, really! Oh yeah, I actually made a few patties last night for a little potluck with friends. Quick and easy to whip up. In a medium-heated large skillet, add a little oil and thoroughly cook the meat and potatoes along with soy sauce, garlic and onions. Set aside to cool. Meanwhile, in a mixing bowl, combine cooled meat mixture with the eggs, tomatoes, cilantro and scallions. Season with salt & pepper and whisk until evenly incorporated. In the same skillet in medium heat, ladle just enough to form a thin pancake-size patty, one batch at a time. Cook both sides, flipping over after 2-3 minutes. Be careful not to over brown the eggs. Transfer to a plate, cut in wedges (for bite-size servings) and garnish with cilantro leaves, if you want.